Bring a large pot of well-salted water (2 heaping tablespoons kosher salt to about 7 quarts water) to a boil. Add the pasta and cook according to package instructions until al dente. Reserve 1 1/2 cups pasta cooking water, then drain pasta. Season the scallops well on both sides with salt and pepper. Heat a 12-inch skillet over high until very hot, 2 to 3 minutes. Add 2 tablespoons olive oil. When it shimmers, add the scallops (working in batches to avoid crowding the pan, if necessary) and cook until golden brown and crisp, flipping once, 1 to 2 minutes per side. Transfer to a plate and cover to keep warm while you make the sauce. Wipe out the skillet and heat the remaining 2 tablespoons olive oil over medium. Add the shallots and cook until they begin to soften, 2 to 3 minutes. Add the tomatoes and cook, stirring occasionally, until they start to burst, 5 to 7 minutes. Add about 1/3 cup reserved pasta water and press the tomatoes gently with the back of a spatula or wooden spoon to get them nice and jammy. Stir in the garlic and red-pepper flakes, if using, and cook, allowing the sauce to simmer, 1 to 2 minutes. Season with salt and pepper. Add the pasta, 1 1/2 cups herbs and 1/4 cup reserved pasta water and toss to coat, adding additional pasta water if needed. 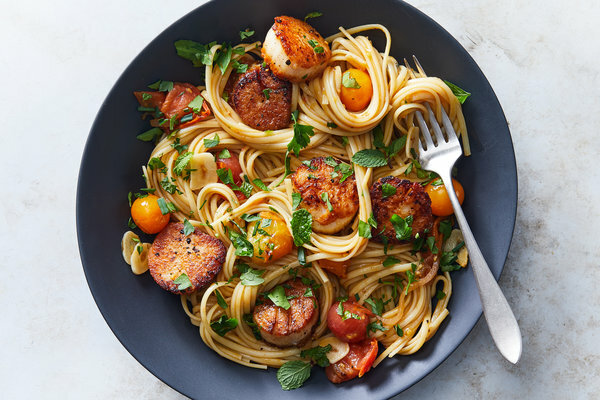 Divide the pasta among shallow bowls and top with scallops. Garnish with additional herbs and a drizzle of olive oil, if desired.